What Topics will we cover today? Which document do I use? 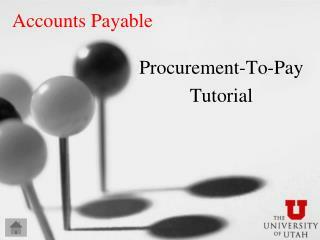 To determine how to pay an item first determine who you are paying. 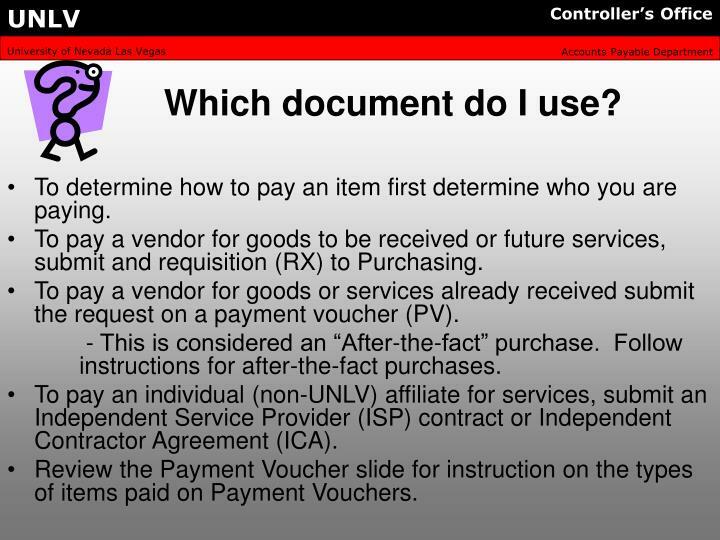 To pay a vendor for goods to be received or future services, submit and requisition (RX) to Purchasing. 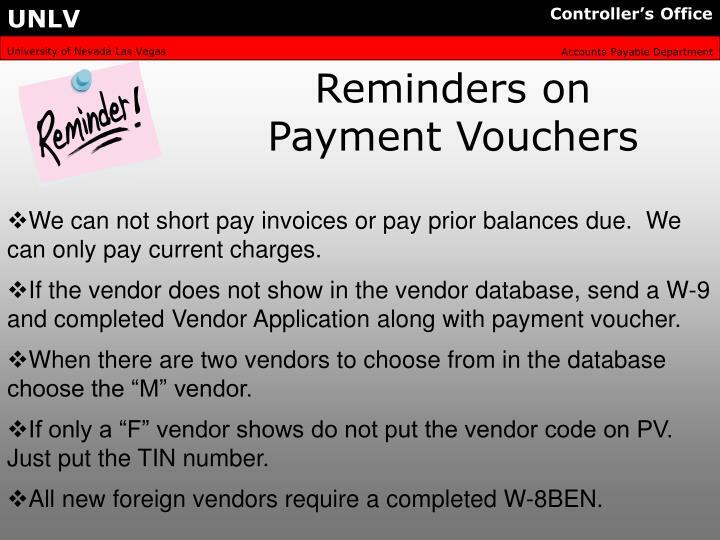 To pay a vendor for goods or services already received submit the request on a payment voucher (PV). - This is considered an “After-the-fact” purchase. Follow instructions for after-the-fact purchases. 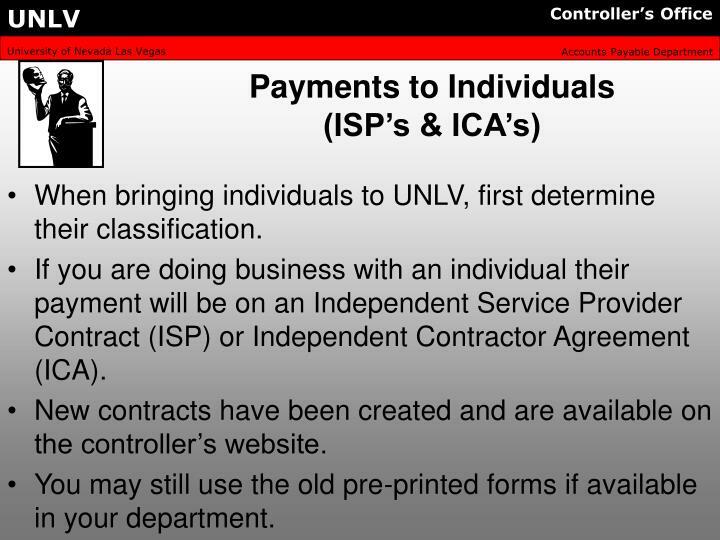 To pay an individual (non-UNLV) affiliate for services, submit an Independent Service Provider (ISP) contract or Independent Contractor Agreement (ICA). 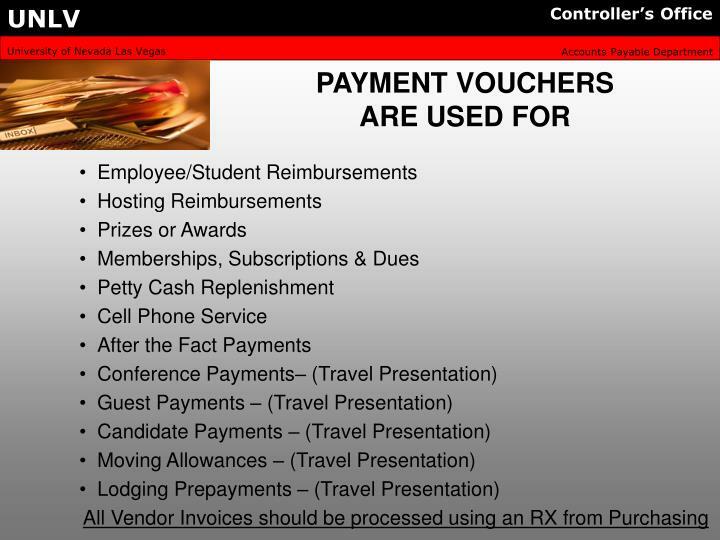 Review the Payment Voucher slide for instruction on the types of items paid on Payment Vouchers. 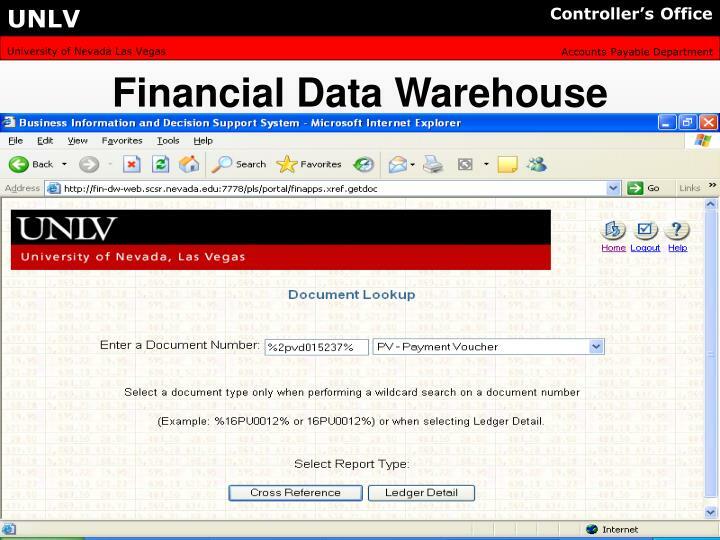 When bringing individuals to UNLV, first determine their classification. If you are doing business with an individual their payment will be on an Independent Service Provider Contract (ISP) or Independent Contractor Agreement (ICA). 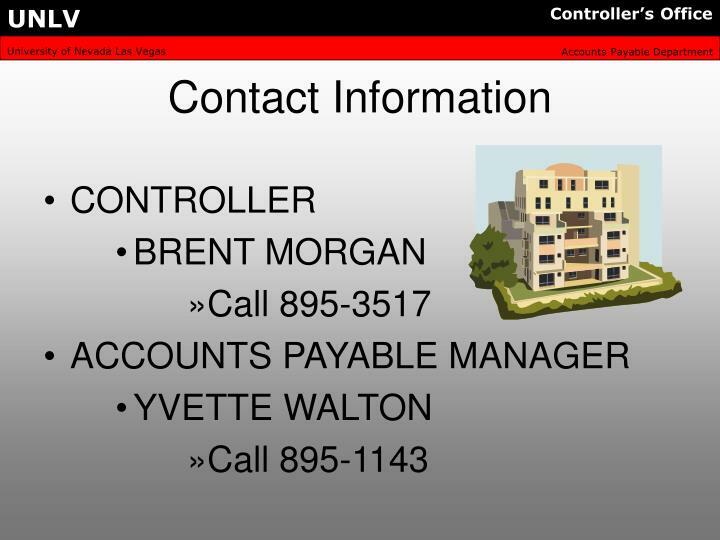 New contracts have been created and are available on the controller’s website. You may still use the old pre-printed forms if available in your department. If the Independent Service Provider has been employed with any of the NSHE agencies within the current calendar year (Jan. – Dec.), do not proceed with using the ISP Form. 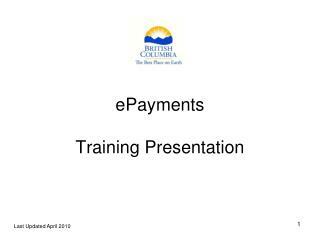 Process payment on an employment document. The IRS says individuals are either an independent contractor (1099 self-employment income) or you are an employee (W-2 wages). 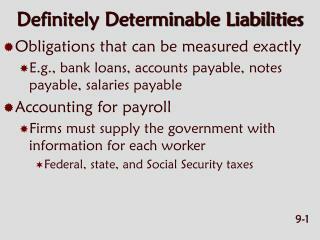 The Accounts Payable Manager will make the determination whether an individual will be paid as an independent contractor or employee. 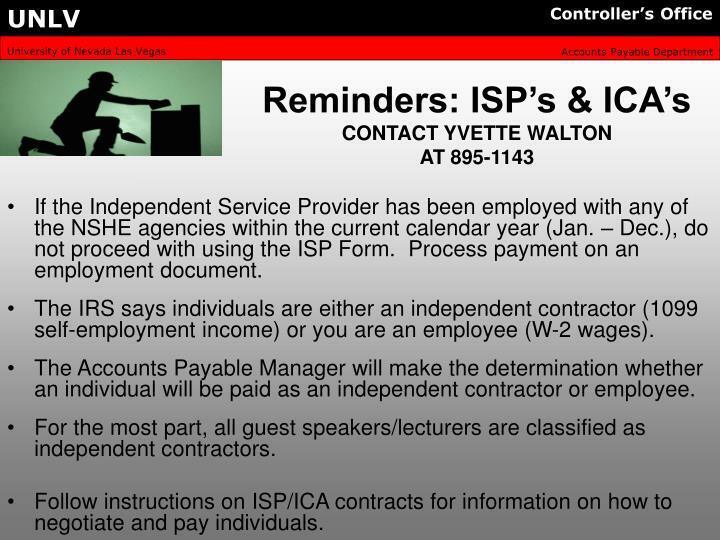 For the most part, all guest speakers/lecturers are classified as independent contractors. Follow instructions on ISP/ICA contracts for information on how to negotiate and pay individuals. It is important that the individual have the correct immigration status for the type of payment requested, or we may not legally be able to pay the individual under immigration law. Accounts Payable handles payments and reimbursements to nonresident alien candidates, volunteers, and independent contractors. Check in advance when bringing in a nonresident alien independent contractor or contracting with a foreign company who will be providing services in the U.S. 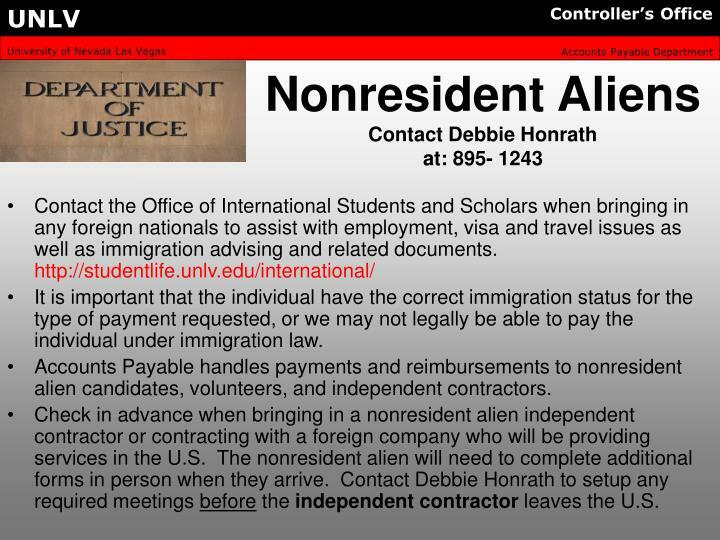 The nonresident alien will need to complete additional forms in person when they arrive. 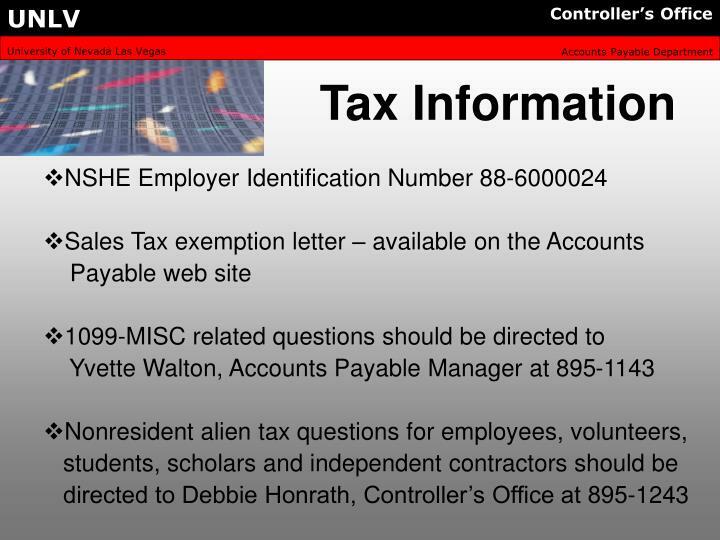 Contact Debbie Honrath to setup any required meetings before the independent contractor leaves the U.S.
Payment Voucher (PVE) forms are available on-line for download and numbers may be obtained by contacting Yvette Walton, Accounts Payable Manager for issuance of a blocks of numbers.- Be sure to keep track of the numbers that have been used. Duplicate numbers are not allowed. 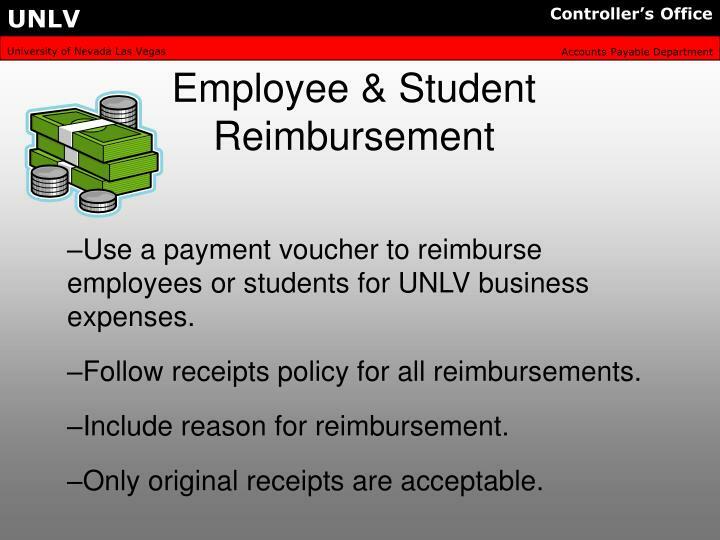 Use a payment voucher to reimburse employees or students for UNLV business expenses. 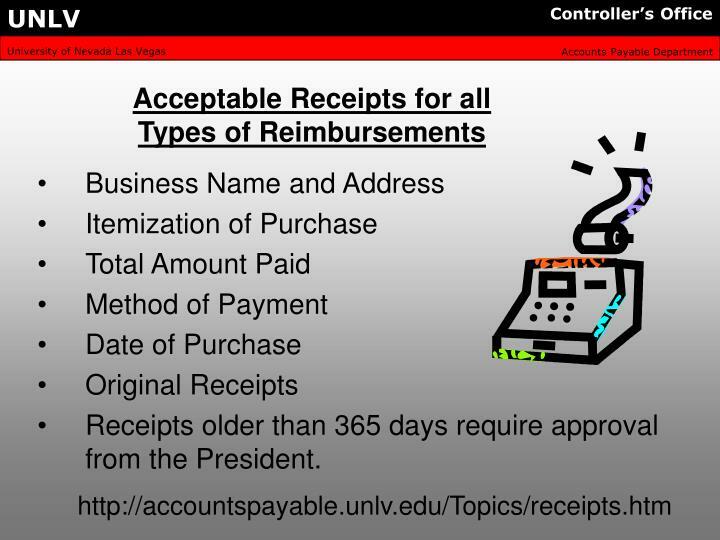 Follow receipts policy for all reimbursements. Only original receipts are acceptable. Receipts older than 365 days require approval from the President. 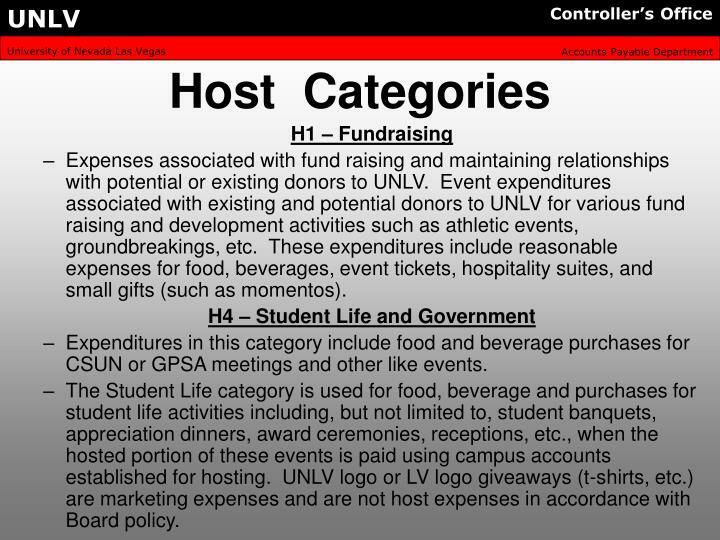 Hosting is a necessary business expense authorized by the Board of Regents and the NSHE. Hosting is subject to specific policies and procedures as documented in the Board’s Handbook, Title 4, Chapter 17 and the NSHE Manual, Chapter 5, Section 1. 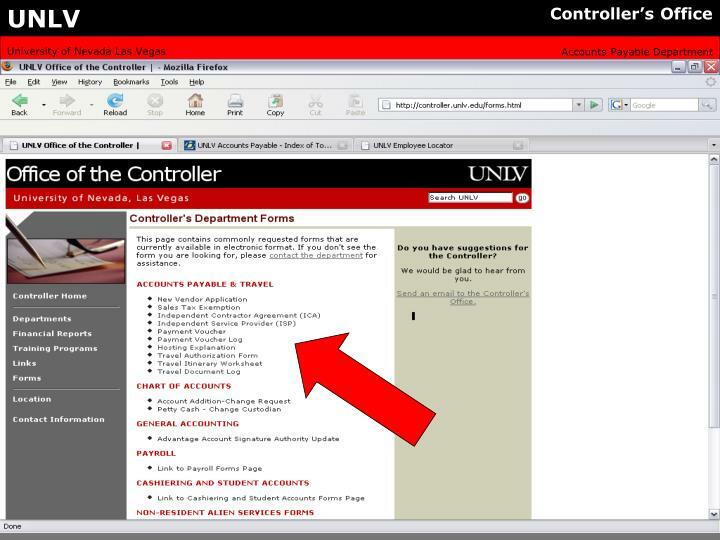 These documents provide strict guidelines regarding host expenses and as such, all UNLV Administrators and staff with responsibilities over host accounts are encouraged to read these documents to ensure an understanding of the authority and limitations provided. All hosting payments need to have the approval of the hosting authority – always the Dean/V.P. or higher unless delegated otherwise. 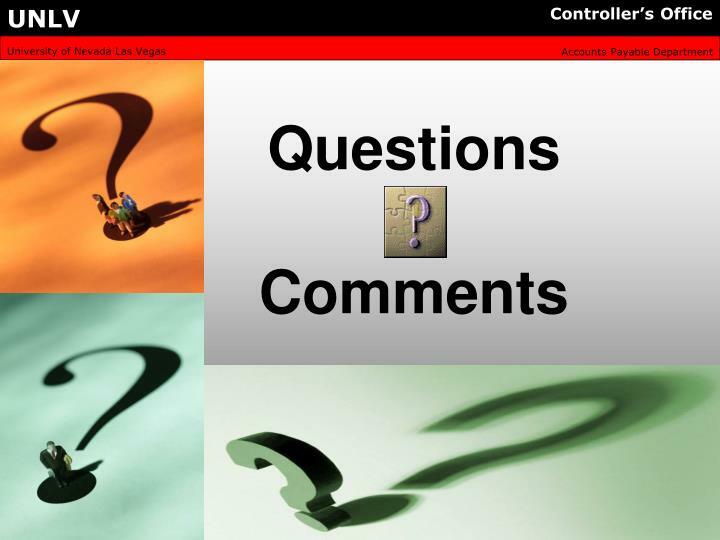 Use the Host Explanation Form to easily communicate the 5 W’s (available on the controller’s website). To identify host expenditures by eligible classification, object code 25 has been created for all host account expenditures. Host object/sub-object codes can only be used with host accounts. 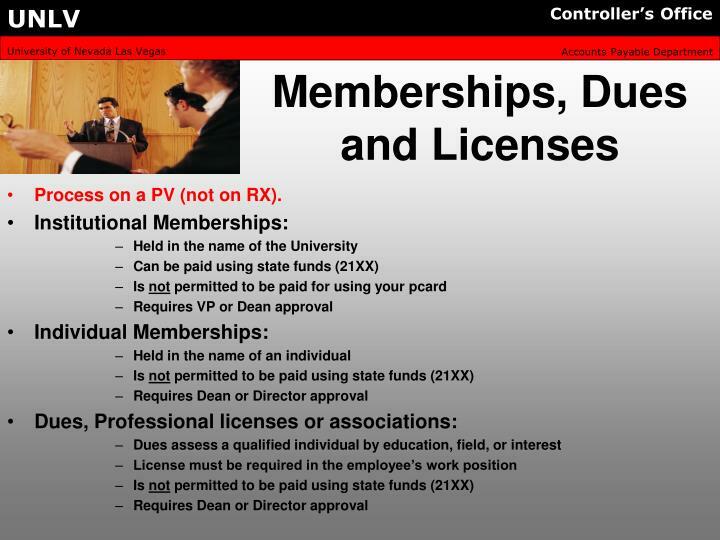 Expenses associated with fund raising and maintaining relationships with potential or existing donors to UNLV. Event expenditures associated with existing and potential donors to UNLV for various fund raising and development activities such as athletic events, groundbreakings, etc. These expenditures include reasonable expenses for food, beverages, event tickets, hospitality suites, and small gifts (such as momentos). 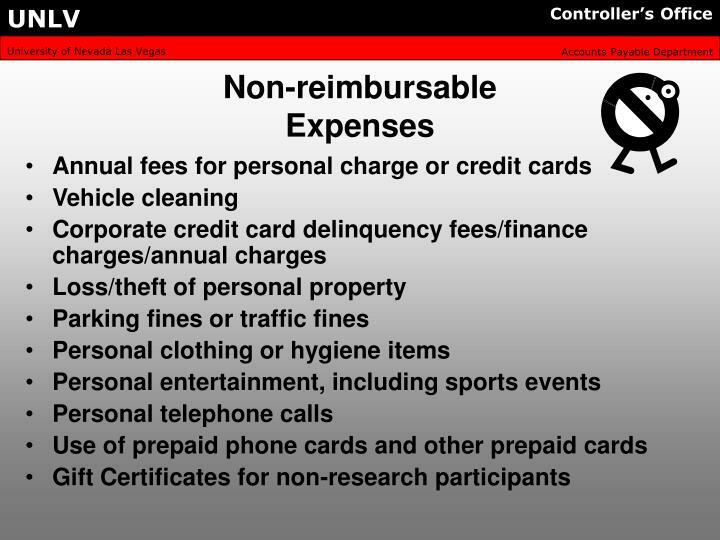 Expenditures in this category include food and beverage purchases for CSUN or GPSA meetings and other like events. The Student Life category is used for food, beverage and purchases for student life activities including, but not limited to, student banquets, appreciation dinners, award ceremonies, receptions, etc., when the hosted portion of these events is paid using campus accounts established for hosting. UNLV logo or LV logo giveaways (t-shirts, etc.) 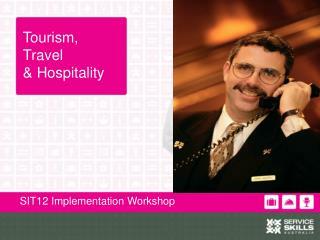 are marketing expenses and are not host expenses in accordance with Board policy. 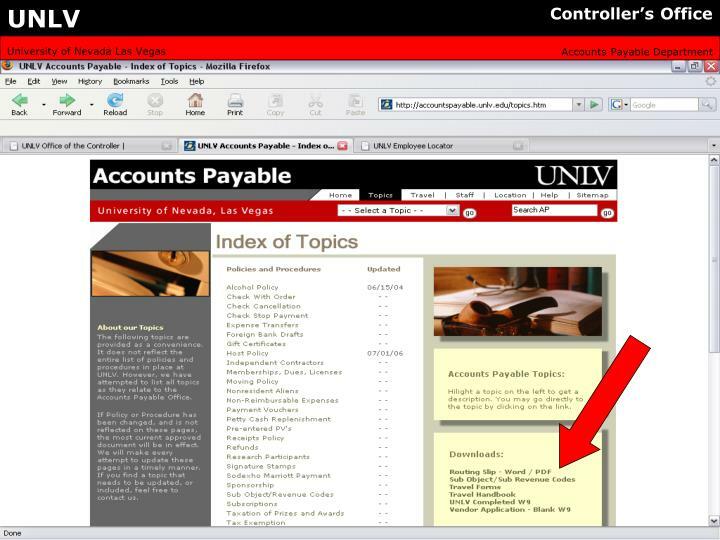 Hosting of this nature is when a UNLV employee or department hosts a person(s) or group not employed at UNLV to discuss university business and/or promote the university in a positive manner with local businesses; members of local, state, national, and international governments; representatives of other non-UNLV groups (accrediting bodies, granting agencies, other universities, etc. ); and approved unpaid guests. These host expenditures should include food and beverage expenses and may include miscellaneous other expenditures, such as holiday cards, monthly local community meeting fees that include a meal; supplies for general reception areas (coffee, soft drinks, individually bottled water, disposable paper and plastic ware, etc.). These expenditures do not include marketing expenses such as giveaways (t-shirts, pens, pencils, mugs, water bottles, pins, etc.). Expenses related to employee recognition promoting goodwill such as flowers or for sympathy, illnesses and births; expressions of congratulations for significant achievements. Hosting expenses are not permitted for recruitment activities, employee professional development, or participant funded events. 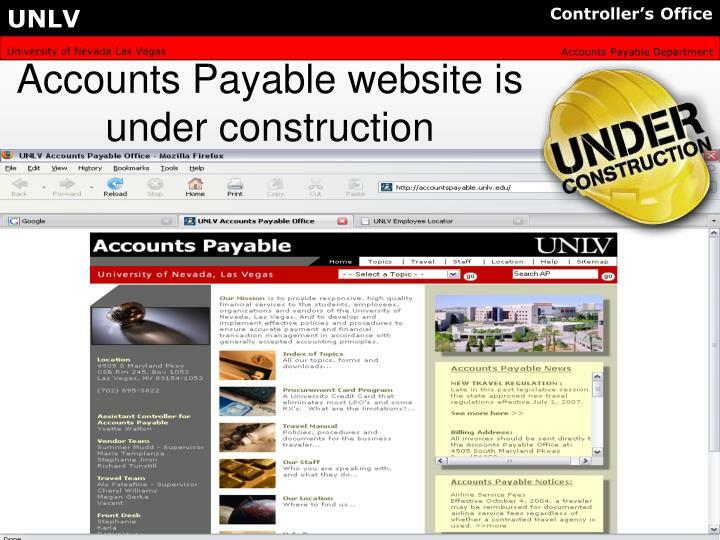 Annual amount limited to $30,000 for entire UNLV institution. Completed "Request to Purchase Tables" form must be submitted to the President's office for approval prior to making a commitment. The approved form must accompany the Payment Voucher. NSHE procedure guidelines must be followed—see Manual, Chapter 5, Section 1.7. No table purchases will be allowed for events hosted by other NSHE institutions or for events hosted by registered political action committees. Table purchases where a private donor or corporation provides a donation specifically for the institution's purchase of a table or directly pays for the table are not subject to the annual $30,000 limit. Completed "Request to Purchase Tables" form must be submitted to the President's office for approval prior to making a commitment. The approved form must accompany the Payment Voucher. 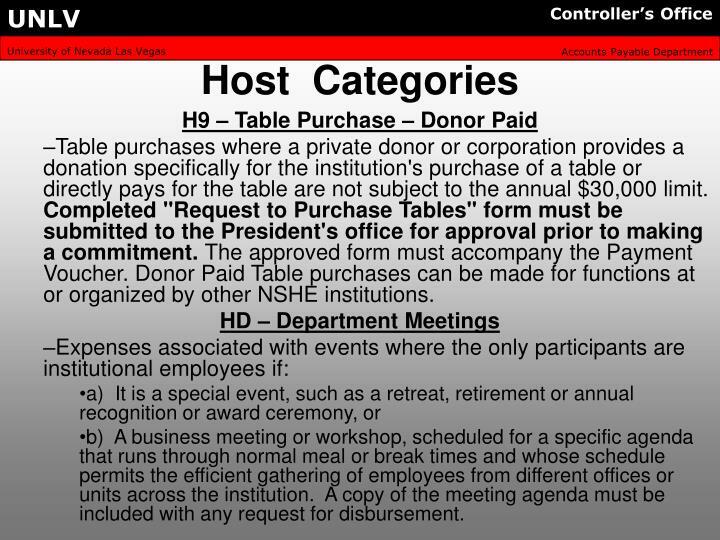 Donor Paid Table purchases can be made for functions at or organized by other NSHE institutions. b) A business meeting or workshop, scheduled for a specific agenda that runs through normal meal or break times and whose schedule permits the efficient gathering of employees from different offices or units across the institution. A copy of the meeting agenda must be included with any request for disbursement. Host expenditures normally may not be charged to Grant accounts. However, OMB Circular A-21, paragraph J28 (Memberships, subscriptions and professional activity costs) Subparagraph C states that the costs of meals when the primary purpose is the dissemination of technical information, are allowable. Grant funded hosting needs approval from Sponsored Programs before we can process it. Host accounts are no longer allowable for Student( H2) & Candidate (H3) recruitment. 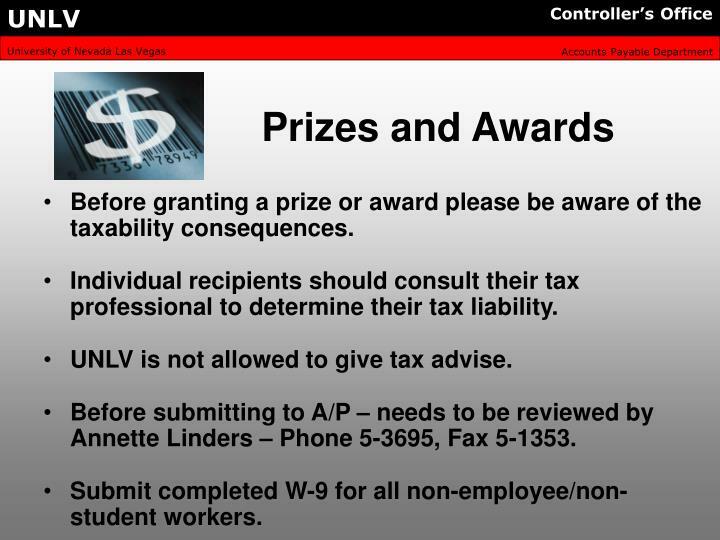 Before granting a prize or award please be aware of the taxability consequences. Individual recipients should consult their tax professional to determine their tax liability. 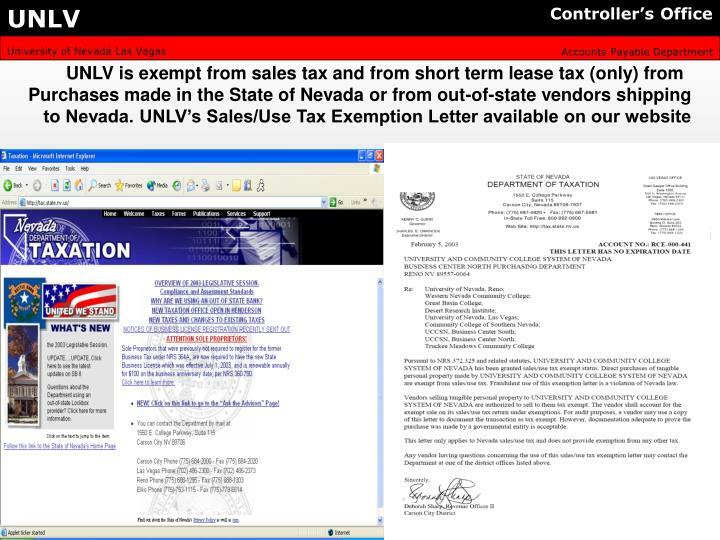 UNLV is not allowed to give tax advise. Before submitting to A/P – needs to be reviewed by Annette Linders – Phone 5-3695, Fax 5-1353. 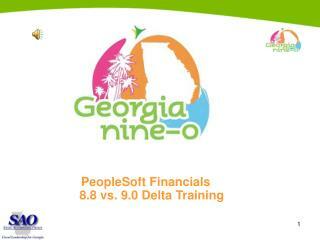 Submit completed W-9 for all non-employee/non-student workers. Because of the accountability issues associated with gift certificates (e.g., they can be cashed for their face value and there is no effective way to account for gift certificates purchased or how and to whom they are distributed), the present policy is that we may neither purchase nor be reimbursed for them. Gift certificates are allowable for research participants with approval from the Office of Research and Graduate Studies. This is the only exception allowed. Process on a PV (not on RX). 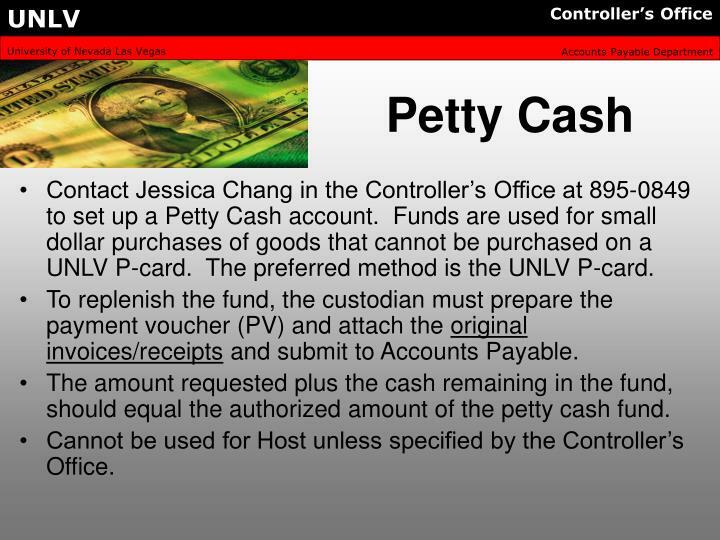 Contact Jessica Chang in the Controller’s Office at 895-0849 to set up a Petty Cash account. 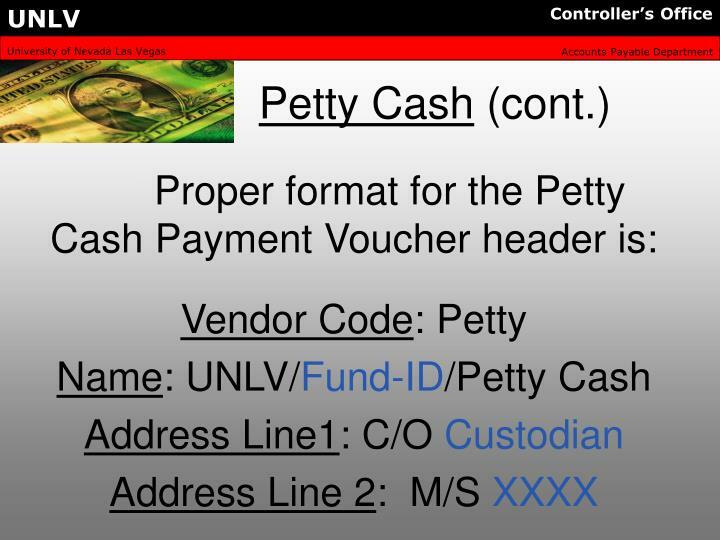 Funds are used for small dollar purchases of goods that cannot be purchased on a UNLV P-card. 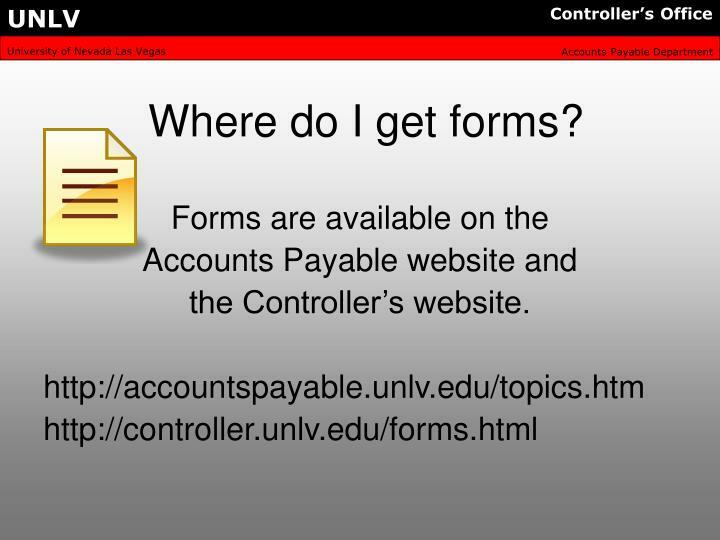 The preferred method is the UNLV P-card. 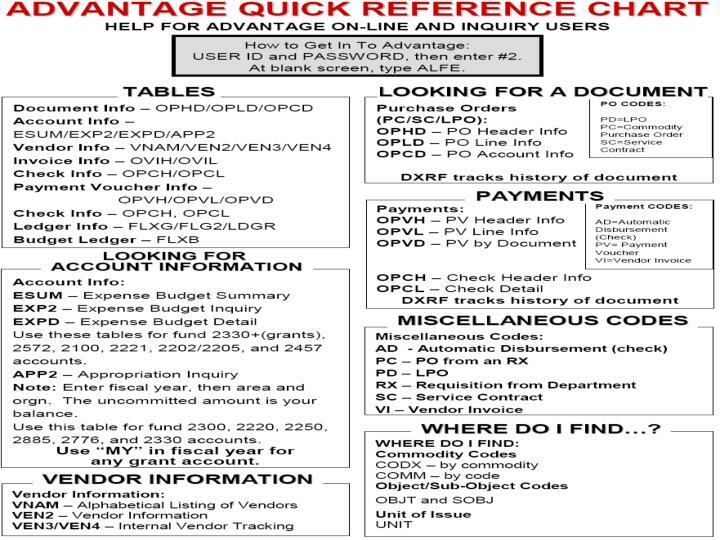 To replenish the fund, the custodian must prepare the payment voucher (PV) and attach the original invoices/receipts and submit to Accounts Payable. The amount requested plus the cash remaining in the fund, should equal the authorized amount of the petty cash fund. Cannot be used for Host unless specified by the Controller’s Office. 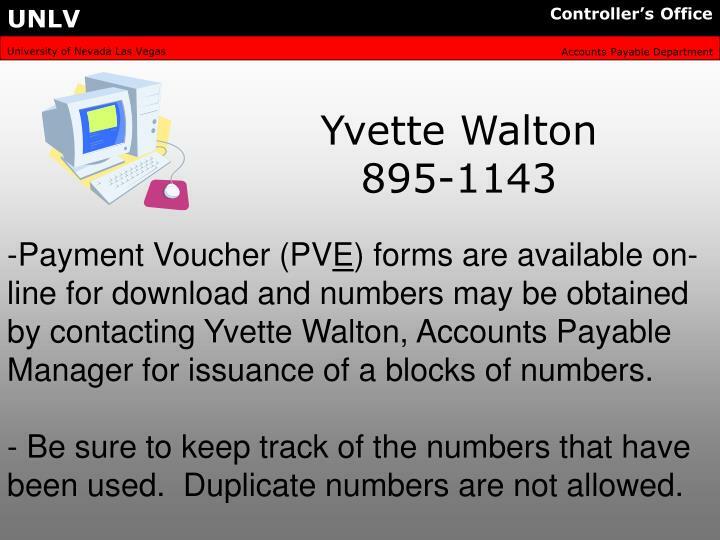 Telephone service may be processed on a payment voucher or can be encumbered on a purchase order. 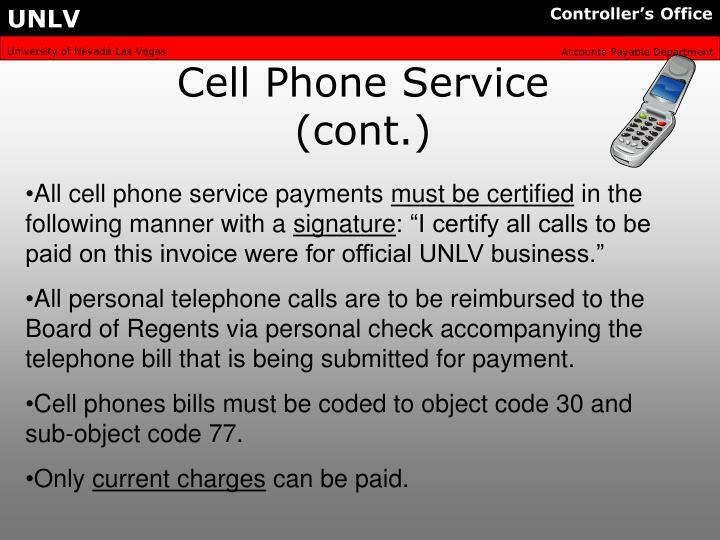 All personal telephone calls are to be reimbursed to the Board of Regents via personal check accompanying the telephone bill that is being submitted for payment. Telephone bills must be coded to object code 30 and sub-object code 86. Only current charges can be paid. 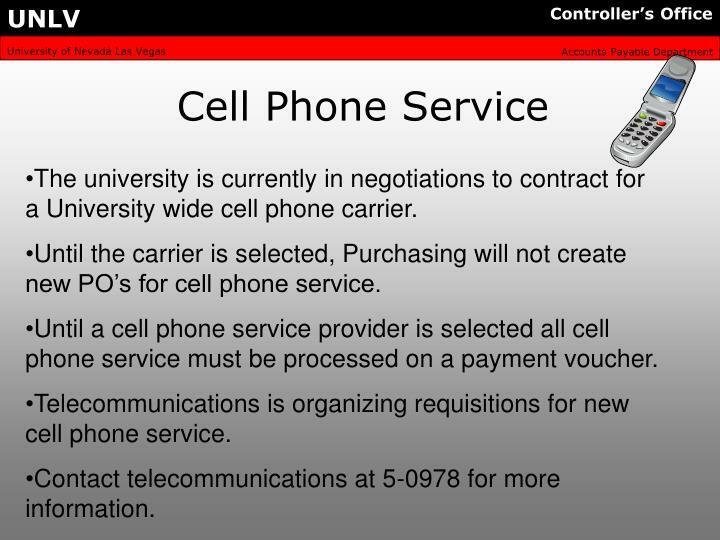 The university is currently in negotiations to contract for a University wide cell phone carrier. Until the carrier is selected, Purchasing will not create new PO’s for cell phone service. 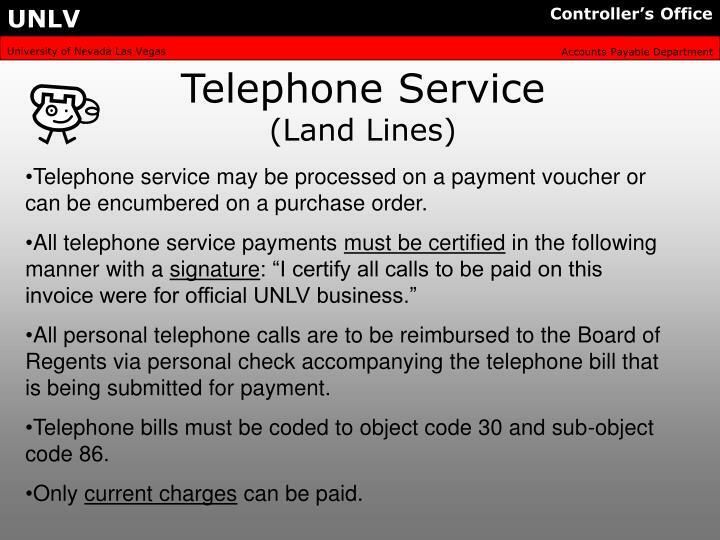 Until a cell phone service provider is selected all cell phone service must be processed on a payment voucher. Telecommunications is organizing requisitions for new cell phone service. Contact telecommunications at 5-0978 for more information. Cell phones bills must be coded to object code 30 and sub-object code 77. All goods or services from vendors should be requisitioned through the Purchasing Department with and RX. If a RX was not submitted before a purchase and a vendor invoice needs to be paid, it is considered an “After-the-Fact” purchase. After-the fact invoices are paid on a PV. 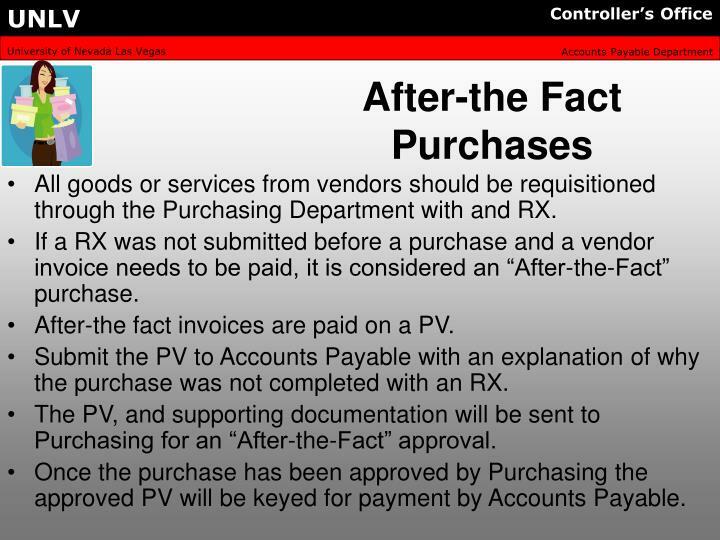 Submit the PV to Accounts Payable with an explanation of why the purchase was not completed with an RX. The PV, and supporting documentation will be sent to Purchasing for an “After-the-Fact” approval. Once the purchase has been approved by Purchasing the approved PV will be keyed for payment by Accounts Payable. Payment by wire transfer may be made, if required by terms and conditions of the contract for goods or services. Should be prepared on a Payment Voucher. Wiring instructions from vendor must be included. 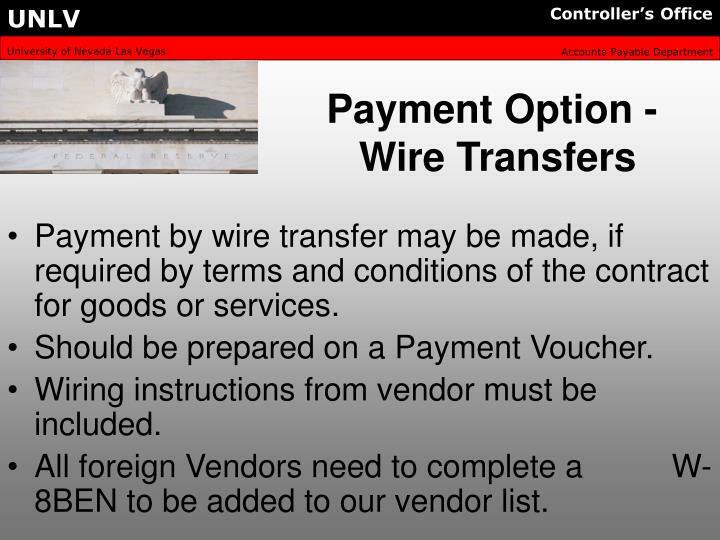 All foreign Vendors need to complete a W-8BEN to be added to our vendor list. 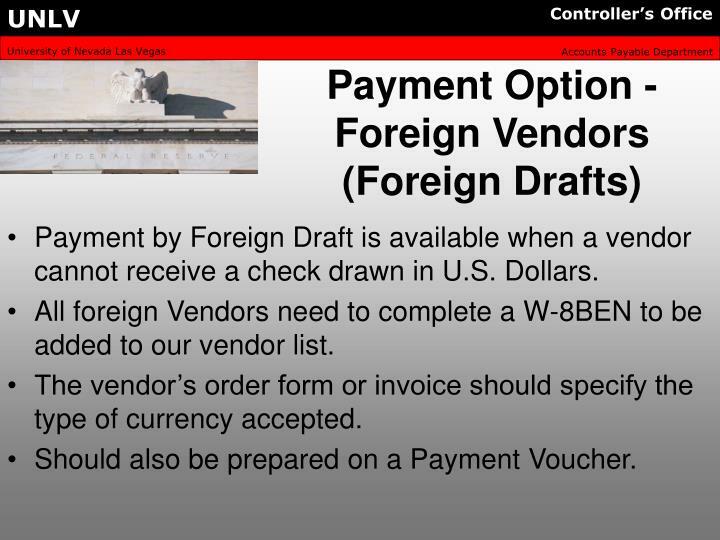 Payment by Foreign Draft is available when a vendor cannot receive a check drawn in U.S. Dollars. The vendor’s order form or invoice should specify the type of currency accepted. Should also be prepared on a Payment Voucher. 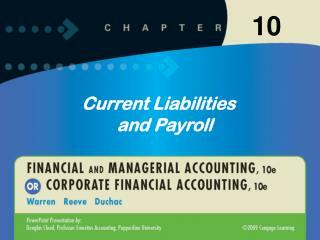 We can not short pay invoices or pay prior balances due. We can only pay current charges. If the vendor does not show in the vendor database, send a W-9 and completed Vendor Application along with payment voucher. When there are two vendors to choose from in the database choose the “M” vendor. If only a “F” vendor shows do not put the vendor code on PV. Just put the TIN number. All new foreign vendors require a completed W-8BEN. RX (Requisition) used for purchases of goods or services of any amount. 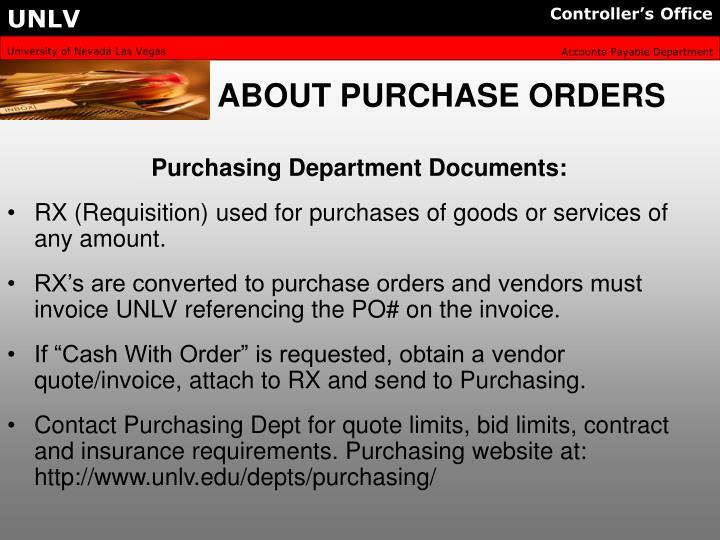 RX’s are converted to purchase orders and vendors must invoice UNLV referencing the PO# on the invoice. If “Cash With Order” is requested, obtain a vendor quote/invoice, attach to RX and send to Purchasing. 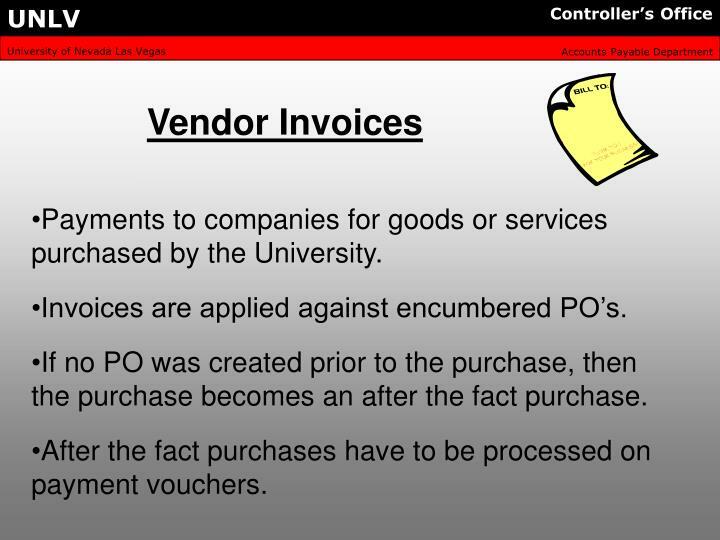 Payments to companies for goods or services purchased by the University. 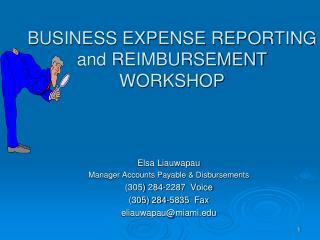 Invoices are applied against encumbered PO’s. If no PO was created prior to the purchase, then the purchase becomes an after the fact purchase. After the fact purchases have to be processed on payment vouchers. 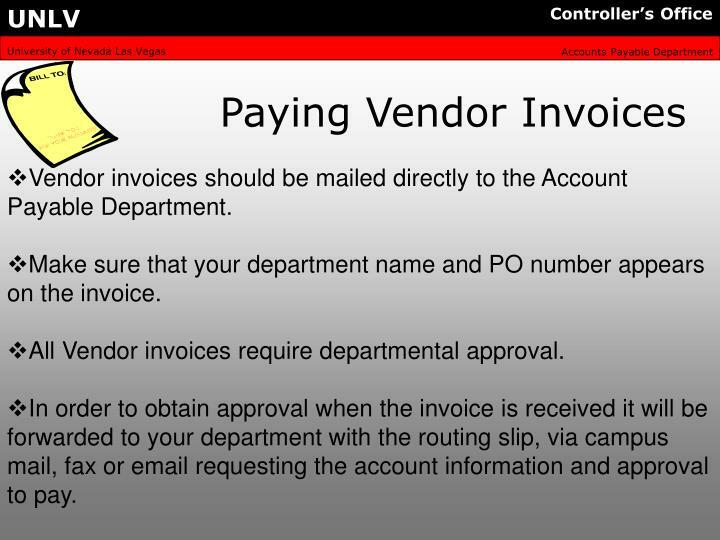 Vendor invoices should be mailed directly to the Account Payable Department. Make sure that your department name and PO number appears on the invoice. All Vendor invoices require departmental approval. In order to obtain approval when the invoice is received it will be forwarded to your department with the routing slip, via campus mail, fax or email requesting the account information and approval to pay. Completed and approved Payment Voucher (PV). Please attach original invoice. Purchase Order number. If the purchase was made without the use of a purchase order, please prepare a PV with the attached invoice and include a detailed explanation stating why a PO was not used. When stamping/approving do not stamp on the remittance advise, as this is sent to the vendor in some cases. 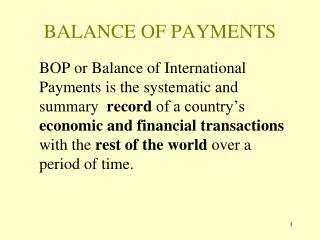 We can not short pay invoices or pay prior balances due. We can only play current charges. 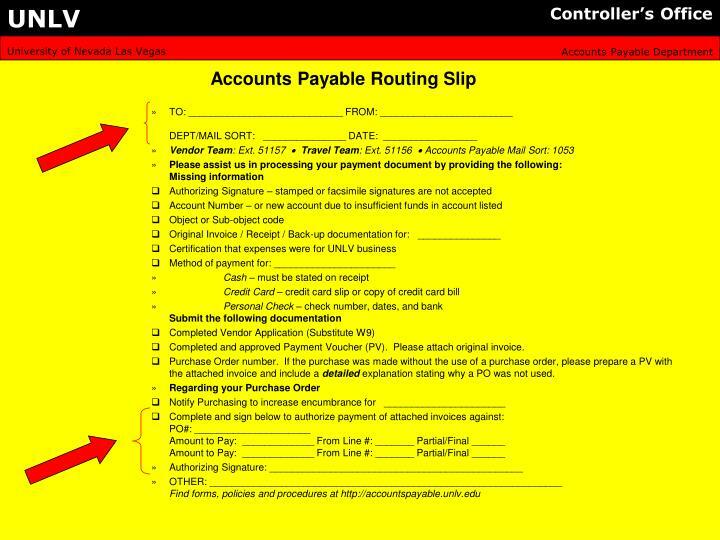 Be sure to indicate which line of the PO you want the invoice paid out of. 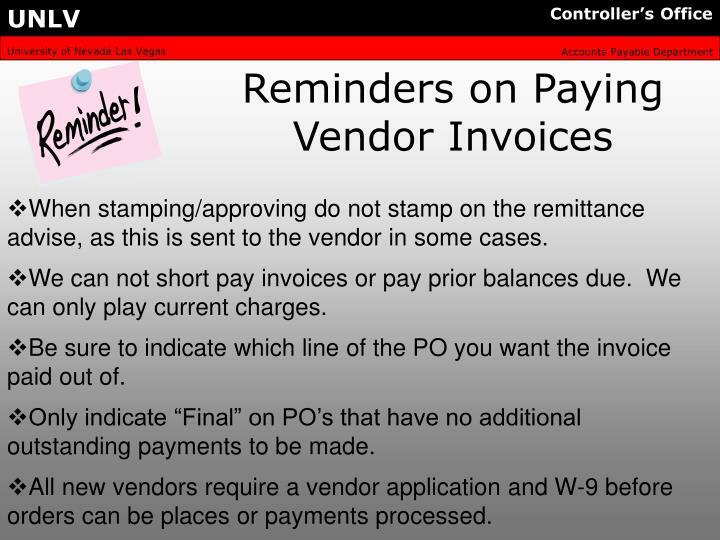 Only indicate “Final” on PO’s that have no additional outstanding payments to be made. 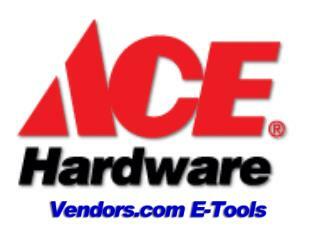 All new vendors require a vendor application and W-9 before orders can be places or payments processed. 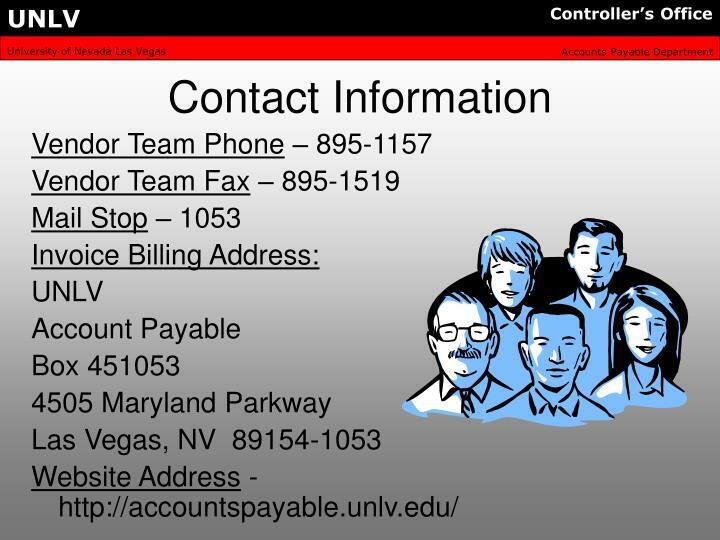 Pcard is a UNLV corporate credit card (MasterCard) issued to an employee (not a departmental card) and is used mainly for low-dollar purchases of goods, and limited services such as hosting, conference registrations, dues, individual memberships, and air fare. 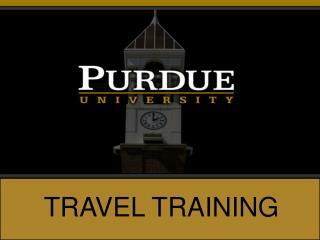 Pcard is now available for air fare purchases for all classes of travelers. 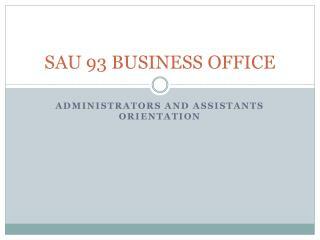 Card eligibility for employees is determined by your Vice President, or Dean, or Director of Intercollegiate Athletics. 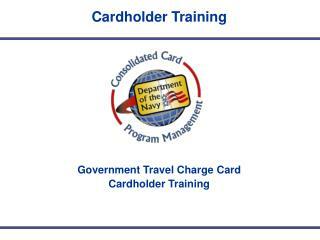 774-2273, the Pcard coordinator for more information regarding applications and training. 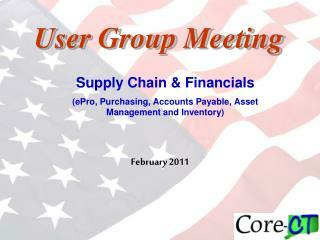 Cardholder must obtain all original receipts/invoices. Liaison will reconcile pcard purchases online each month. All documentation is kept in your department for seven years. The Financial System group is responsible for the delivery and integration of the financial business functions of accounts payable, accounts receivable, budgeting, fixed assets, purchasing and employee travel for the Nevada System of Higher Education. 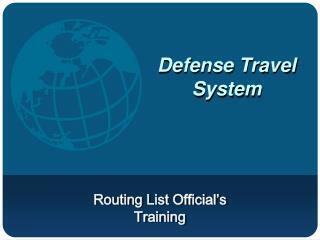 It is user friendly, provides multiple sources of information and is a great research tool. 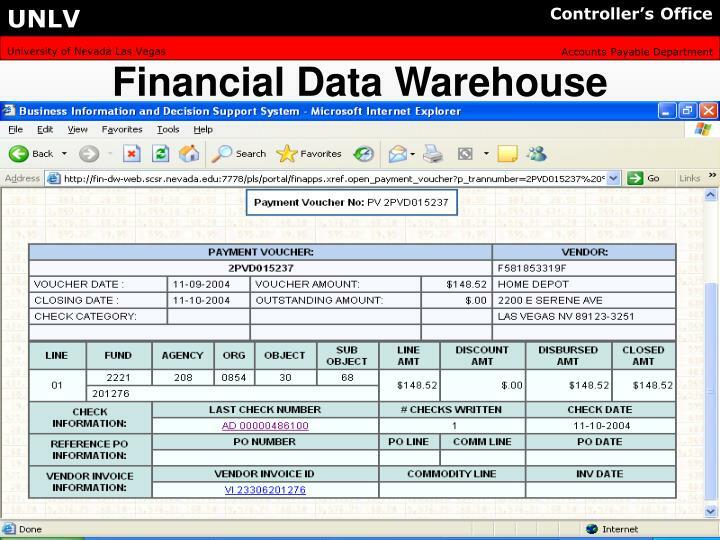 It provides a number of reports available within the data warehouse. 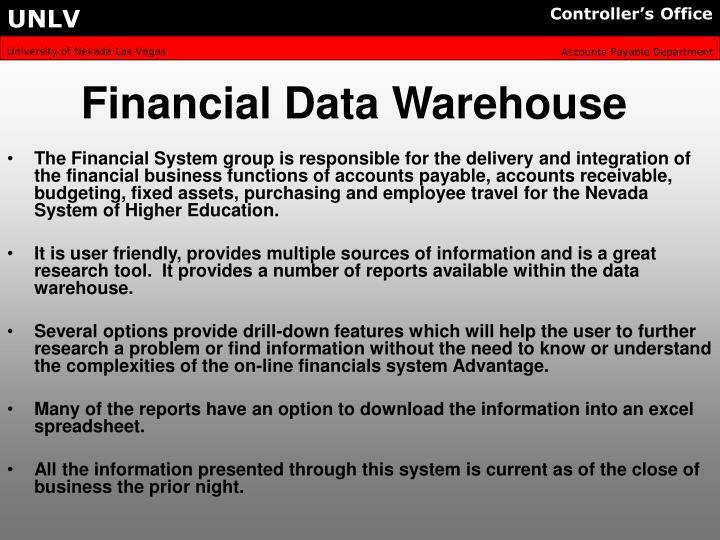 Several options provide drill-down features which will help the user to further research a problem or find information without the need to know or understand the complexities of the on-line financials system Advantage. 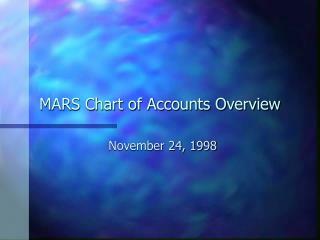 Many of the reports have an option to download the information into an excel spreadsheet. All the information presented through this system is current as of the close of business the prior night. 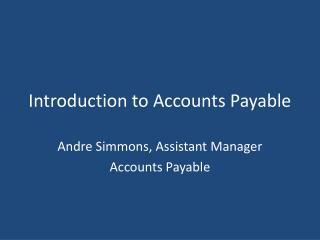 Why does Accounts Payable have so many policies and procedures that we must follow? 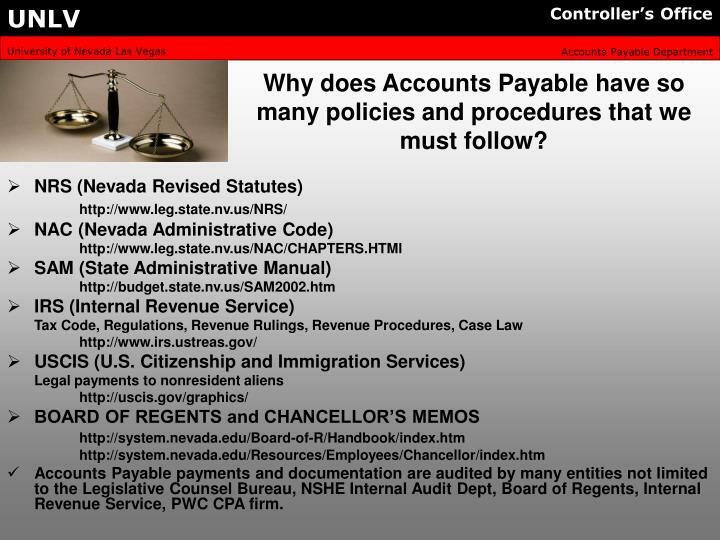 Accounts Payable payments and documentation are audited by many entities not limited to the Legislative Counsel Bureau, NSHE Internal Audit Dept, Board of Regents, Internal Revenue Service, PWC CPA firm. 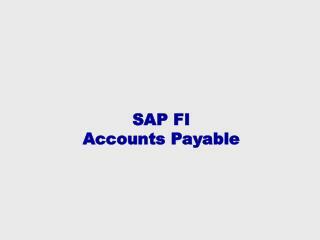 What information do I need when I call Accounts Payable? 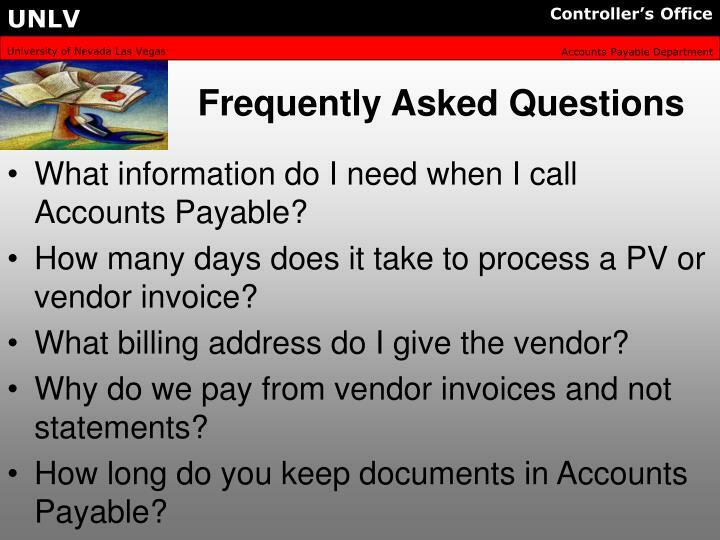 How many days does it take to process a PV or vendor invoice? What billing address do I give the vendor? 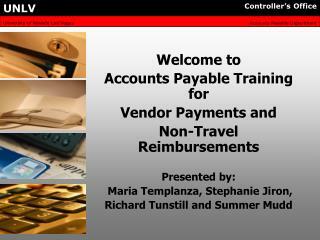 Why do we pay from vendor invoices and not statements? 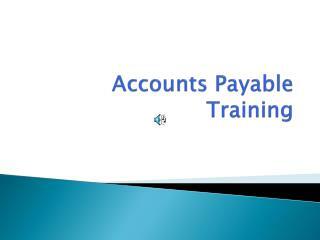 How long do you keep documents in Accounts Payable? 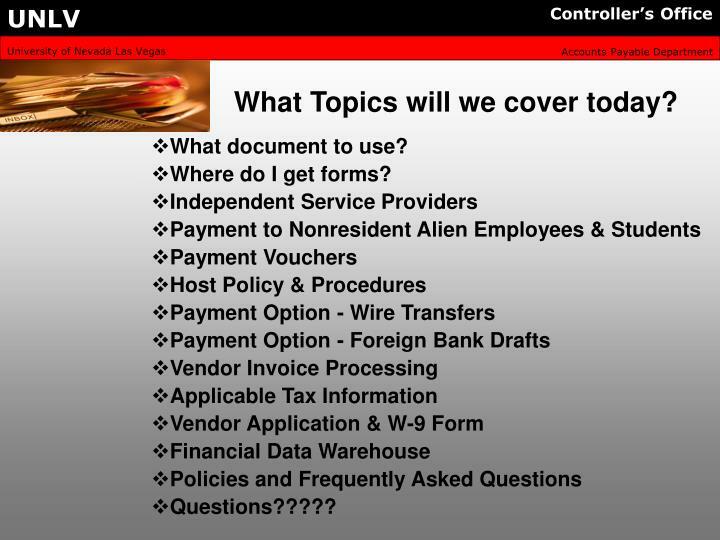 Vendors - Agenda -Vendors.com - agenda. the 5 w’s and the h vendor lost sales vendor lead time system break vendor item reference list (virl) s.m.a.r.t quick response score card vendor report card asn compliance questions?.